If you are like most, keeping tax records is not your forte; in fact, it’s difficult, frustrating and exasperating if you haven’t been vigilant about keeping things all year long. We know that people who do, usually get better results on their tax returns come filing time. Therefore, January is a good time to organize not just last year’s records, but this year’s too. In some cases, records and supporting documents that relate to certain transactions must be kept indefinitely. This can include the acquisition and disposal of property, share registries, capital loss balances and other important historical information that can affect future tax returns, or have an impact upon the net tax results from the disposition or wind-up of a business. Look to Information Circular 78-10 for the consequences. For example, if a person fails to provide any information or documents requested by the tax man, including books and records, Section 231.2 of the Act gives the government the power to require you to provide the information or documents requested. If you fail to maintain adequate books and records or provide the information or documents CRA can prosecute you. If they win, on a summary conviction, and in addition to any penalty otherwise payable, you may be subject to imprisonment and/or a fine not less than $1,000. Alternatively the CRA may apply to the court for a Compliance Order in which a judge would order you to provide any access, assistance, information or the document sought by the CRA. It’s Your Money. Your Life. Recordkeeping for tax purposes is not optional. It’s also a very astute way for you to make better financial decisions for your family. You’re the CEO of your own money. Make sure you have all the documents to verify your personal net worth, not just for the taxman, but because that makes sense from a wealth management and estate planning point of view too. Your professional tax and financial advisors can help. Evelyn Jacks is President of Knowledge Bureau and author of Essential Tax Facts 2012 and Financial Recovery in a Fragile World. Having escaped a -40 day in Calgary yesterday on our nationwide T1 Tax Update Workshop Tour, the beautiful sunrise over Vancouver today reminds me why this lovely province is a retirement haven; a lifestyle many Canadians work years to save for. Yet for many, saving for retirement has been more difficult recently, and certainly more expensive. We may therefore look back at the significance of the pension reforms being introduced in Canada in 2012 for many years to come. This month a multitude of changes to the Canada Pension Plan begin; as well, we look forward to the passage of federal and provincial legislation that will bring life to a new pension savings opportunity–the Pooled Retirement Pension Plan (PRPP). Currently 16.5 million people contribute to the CPP; with 6.5 million drawing benefits from it. While that number of pension recipients will increase dramatically as baby boomers retire over the near short term, the CPP is in good shape–sustainable for the next 75 years at current contribution rates–according to the Finance Department. The PRPP fills a gap for the self-employed as well as employees whose employers do not provide an employer-sponsored fund. That trend has been increasing. . .the proportion of working Canadians who have access to such plans has declined from 41% in 1991 to 34% in 2007; leaving a gap in discretionary retirement savings opportunities for about 2/3 of Canadians, which the PRPP will help to close. The PRPP is also a particularly attractive new option for small business owners, who may have found participation in the existing Registered Pension Plans–defined benefit or defined contribution–too expensive. The PRPP will provide access to a large-scale, professionally administrated and lower cost pension plan, together with an opportunity to split retirement income with the spouse sooner, than under current RRSP rules. According to background information provided by the Department of Finance, Canada’s retirement pension system is already a world model recognized by the OECD (Organization for Economic Co-operation and Development) for its success in reducing poverty and providing high levels of income replacement for retirees. These new pension reforms should help make retirement even better for disciplined savers in the “gap” categories. It’s Your Money. Your Life. This tax season, be sure to ask your tax and financial advisors about these new retirement savings and income replacement changes and what they mean to you and your family in 2012 and beyond. Evelyn Jacks is President of Knowledge Bureau, which offers a certificate self study course on Tax Efficient Retirement Income Planning. She is also the author of Essential Tax Facts 2012, and co-author of Financial Recovery in a Fragile World. It’s important to abandon short term economic thinking in favor of “sustainable capitalism”. We face a rare turning point in history when dangerous challenges and limitless opportunities require clear, long-term thinking to solve disruptive threats like climate change, water scarcity, poverty, disease, growing income inequality, and massive economic volatility, to name just a view. Companies and investors will ultimately be the ones to mobilize the capital needed to overcome these challenges. Sustainable capitalism is defined as a framework for the maximization of long-term economic value by reforming markets to address real needs, all-the-while integrating environmental, social and governance metrics throughout the decision-making process. I found that extremely interesting. At the Knowledge Bureau, we have pioneered the development and implementation of a framework for the sustainability of family wealth. We call it Real Wealth Management™ and thousands of students—most of them tax and financial advisors from across Canada–have taken certificate training programs over the past eight years in order to facilitate joint decision-making between the client and his or her professional advisors following a strategic framework for accumulating, growing, preserving and transitioning wealth with future purchasing power—after taxes, inflation and fees. Authors Gore and Blood argue that integrating sustainability into business practices enhances profitability, helps companies save money by reducing waste and increasing efficiencies throughout their supply chains; it also improves human relations to increase employee retention and therefore reduce the costs of employee training. Sustainability modeling also helps companies achieve higher compliance standards and better manage risk, because they have a better and more holistic understanding of the issues that affect their businesses. This is entirely true of the Real Wealth Management framework for family wealth sustainability. It challenges those who have trouble managing their income and creating capital to better understand how they use their money; trading in short-term, reactive financial responses for a future-oriented approach. This involves following a consistent strategy and a measurable process in building individual and family net worth over the long term. Taxation is a large factor in this endeavor because it is one of the biggest eroders of both income and capital over time. As tax season is upon us, it makes sense to begin now to plan to increase after tax income for 2012 and accumulate and grow intact capital that will reliably produce income for the future. It’s Your Money. Your Life. In a volatile economic environment, it may make more sense than ever before to learn more about the Real Wealth Management framework so you can better accumulate, grow, preserve and transition wealth. Given that it’s the start of a brand new year, you may find yourself creating new opportunities for a brighter, more secure financial future. Wouldn’t it be good to replace financial worries with peace of mind? Happy New Year! Evelyn Jacks is President of Knowledge Bureau, an educational institute which focuses on excellence in financial education. For more information on Real Wealth Management, please see www.knowledgebureau.com. 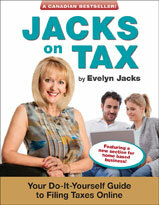 Evelyn is also the author of 48 books; her two latest are Essential Tax Facts 2012 and Financial Recovery in a Fragile World, the latter co-authored with Robert Ironside and Al Emid.